A BEAUTIFUL KP Morning to you all this January 11, 2014! We are still in need of some Spanish-speaking volunteers so we can communicate better with our Spanish-speaking friends in need. Please let us know if you can help donate sandwiches on a weekly basis. Praise God for another blessed day at KP. 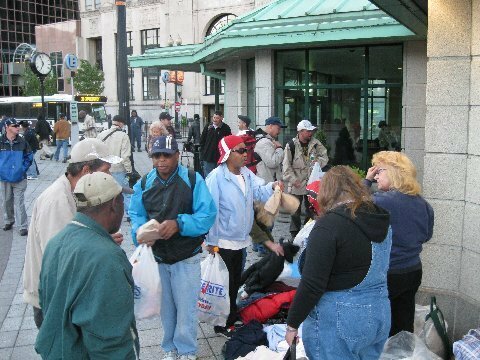 God blessed us by holding off the rain that was predicted and we were able to pass out lunches, clothing, sandwiches, coffee, juices, soda, water and snacks and keep warm and dry! 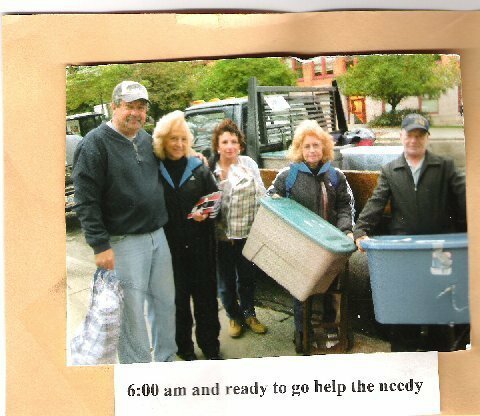 All the homeless are so thankful for your kindness and thoughtfulness in all you have and are still continuing to give …..You are such a wonderful blessing to this ministry. Thank you for all you do! We love you! Kevin Alexander…..needs Timberland boots for work. size 8 1/2 . Frances…. Loves the Lord and the LIU service… said he cant wait to come again. Jason…. still giving his testimony of how God saved him from dying after being in a coma from drug overdose. Asks that we keep him in prayer to continue to stay clean and do God’s work. Inez …. and all her Spanish friends who are at KP every week. They always get blessed from all that you provide for them… They speak Spanish primarily but do understand a little English … so we have a little trouble communicating with them.we have invited them to come to pt several times and they always seem enthused about coming… but have not as yet. Pray that they will come and find the love of God and meet all of you and find the love of all you who pray and provide for them. Haji …. He needs a 1x or 2x size winter jacket. (he asks us every week)…if anyone has one they no longer need and can donate please see Jan or Ginny. He is wearing a leather jacket now, but I think he needs a winter storm jacket as well …. being out in the snowy and winter cold. Jackie… Desperately is seeking a place to live and is growing weary from all the stress. Please pray she finds an apt and that God will be with her and give her peace. Cheryl….. her daughter just gave birth to a baby boy… Cheryl is so blessed to have a new grandbaby …she was so proud showing us his picture with her bright beautiful smile… and asks Gods blessing on him and their family . Ray….. for his daughter to stay safe and well…Also is grateful that God has helped him with his finances and he was able to purchase a used car and pay it all off.. This is also the man I had asked for prayer for last week that God would lift his spirits. Praise God ! He was blessed with a settlement check he had been waiting on. Esta …. needs a place to stay…and asks for strength to get thru. Andy…. Our own faithful usher at pt. That God will meet all his needs and bless him abundantly.. he is always there at kp helping us each week too. Thank you Andy ! Dave …. Has many needs…. has been living on the streets many years… always sweet ,and polite and always asks for prayer to find a home .. LOVES, LOVES, LOVES YOUR EGG SALAD SANDWICHES!!! Dave…. this man use to come to PT many years ago… we had not seen him for a long time. He needs a home .. and pray that God will break through all the barriers in his life. Erwin…. said ” lets pray that the Pats win !!! ” Yay ! Go Pats !!! Brian …. God Knows…… also needs size 36/34 jeans and size 10 timberland boots. Charles ….. still needs a job… looking for work so he can get off the streets. Ginny ….. on the mend from her sinus infection …continue to pray for complete healing. Prayer for all who are ill and all who need healing and relief from any pain and suffering. May God’s healing hand restore them with new health and strength. For our brothers and sisters who are struggling with addictions , also those who have been freed from them but may have fallen victim to it again…. May God’s love and mercy reach down and pick them up and help them to start over and begin anew. And may their healings become a testimony to others who may need help and encouragement . Lord restore the broken …restore lives… that you may be glorified. Lord send us counselors and mentors so that those who are on the road to recovery may be encouraged and stay committed and find the path God has planned for them. Open the floodgates of heaven Lord to bring peace and joy to the broken hearted to those whose eyes are filled with tears , to the lost and confused… to those who are seeking to find something that will satisfy ..Let them see and hear your voice speaking and drawing them to yourself. For you oh Lord are all that we need…. You are calling us to yourself …. you are all that they are seeking…. Some looking in all the wrong places… Unknowingly… they are seeking YOU lord …. .. ONLY YOU can satisfy our souls. You alone are all that matters.You alone can make all things right. Break thru the walls and barriers that have built up and keep them bound . Lord Bless all those who are faithful in prayer and deed…. and in giving the provisions that are so desperately needed in this ministry. Lord please meet the needs of all who read this…also all who are in need in our church family as well. and all those ( who…. due to making some wrong decisions along the way in life) have lost so much of themselves and are out there trying to survive…. and have little to next to nothing to live on. We ask lord that you renew and restore the hope that so many have lost. Restore the lives of those who can’t seem to find their way back to you.